I still remember there was one time that Norton Anti Virus had became the most favorite anti-virus software among computer users, with high detection rate and fast performance. It was during 2002 if not mistaken when I am still using Windows 98 as my primary operating system. As time goes on, with the advent of many different new companies (Kaspersky, Eset etc.) for computer protection software, it doesn’t seems that Norton have it’s own protection software improved, but it is getting bulkier and bulkier, and of course, it is always blamed for the slowed-down computer performance. It was the time that I totally give up with Norton products and whenever my friend asking for my opinion for AV software, I’d tell them to say no to Norton’s. Frankly speaking, initially I didn’t think of testing any Norton’s product, ever since my bad experience with their pervious products. 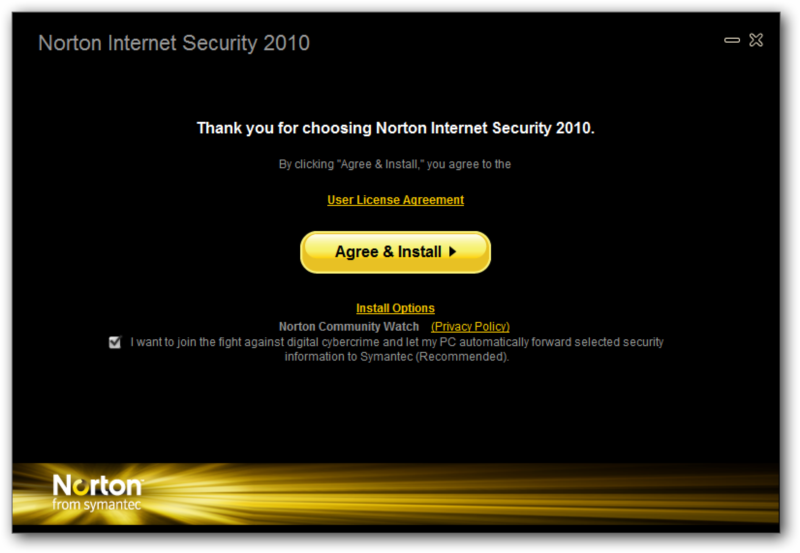 However, my frequent visited forum Lowyat.net has a free offer for Norton Internet Security 2010, with the pre-requisition of a ‘short’ review of the software. Although with the bad experiences several years ago, I have decided to test their product once again, and I ought to see some improvements over the previous bulky-slow products. Indeed, I felt comfortable with my previous setup: Microsoft Security Essential, IOBit Security 360, and Windows own firewall program, but in order to give NIS 2010 a shot, I had them uninstalled from my computer. After a restart, I had NIS 2010 installation executed. 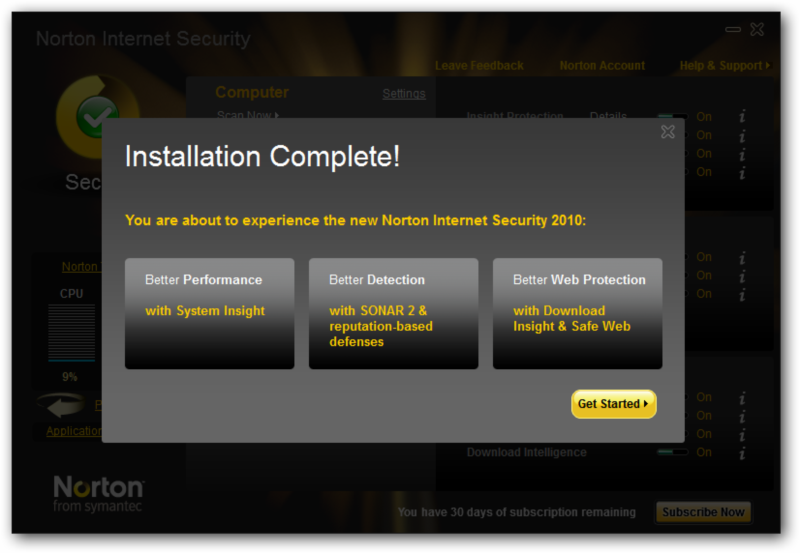 Before the installation, it does allows you to choose other location on your drive for it to get installed if you do not want it to install in the default folder, as well as the option for you to tick whether to join Norton Community Watch (A plugin that allows you to join all the user around the world to fight viruses threat by automatically have the security information sent to Norton server). After around two minutes, NIS 2010 congratulated me for the completed installation. It claimed that NIS 2010 has better performance, better detection and better web protection. We shall see. Indeed, it doesn’t look simple, but what can you expect from a complete suite of internet security program? The interface looks clean for me though with all the easy-slide option for three main sections: Computer, Network, and Web. 73 days ago? So instead of testing the software right away, I had the LiveUpdate running to update the virus definition etc. (Around 16MB which is still acceptable). Besides that, it does installed a Windows Sidebar Gadget that give you immediate warning if your system is at risk or a green light for your computer. Handy enough? If you have a pair of sharp eyes, you probably noticed that it has a CPU meter at the left side of the main interface. CPU meter shows you how much you processor currently used, and the Norton meter beside it gives you an idea that how much NIS 2010 taken up the CPU. And you probably also noticed a big turning arrow says Performance. Click on it and you will be greeted with a nice 3D flipping to the Performance interface. For more advance functions, you can always access Norton Tasks which allows you to turn off the any running process in NIS 2010 when necessary. You can also turn on the silent mode (A mode that Norton Internet Security suppresses all alerts and suspends the background activities for the duration that you specify) from Norton Tasks too. Sometimes you had several unfamiliar executable files running when you checked the Windows task manager, but you do not know whether they do good or harm on your system. This is where Application Ratings come to help you. It can help you to rate all the running processes, all the files etc. for their trust level, and of course, it will let you know how popular is the certain file/process used by the Norton Community. If the usage is rated ‘Many Users’, most likely the file/process is safe enough, at least you know you are not alone. Application Ratings is particularly useful for those who are still new with computer, as most likely they lack of knowledge for differentiating infected files/processes, thus Application Ratings come in handy when they wanted to know more on some suspicious files. All in all, a good feature to have, simple to use, and very straight forward. How frustrated you are when you are in the half-way of killing your enemy in GTA IV and suddenly a pop-up tells you that your AV software has been updated? I had this several times with several different AV software and it seems that they never realized those notification or pop-up are just too annoying, when you have a full-screen application running. Not too sure about other company, but for the same concept, I experience it in Norton Anti Virus Gamer Edition. It can automatically detect a full-screen application (usually computer game), and it will suspend everything from disturbing the end user, but still protecting the computer from threat at the same time. Same goes to Silent Mode, with the full-screen application detection turned on by default in NIS 2010. As mentioned before, you can also enable silent mode manual via Norton Tasks, when necessary. I’d say this is a gamer-must-have feature in AV software, so another point here. Most of the features in NIS 2010 can also be found in rival software, such as Anti-Spyware, Proactive Defense (SONAR Protection in Norton), Firewall, Email Protection, Safe Surfing, Web Protection etc. Parental Control is available too, except it need to be installed via Norton Add-On pack which can be accessed here. However, after several testing, I had found something doesn’t work well enough. The Norton Safe Web feature. 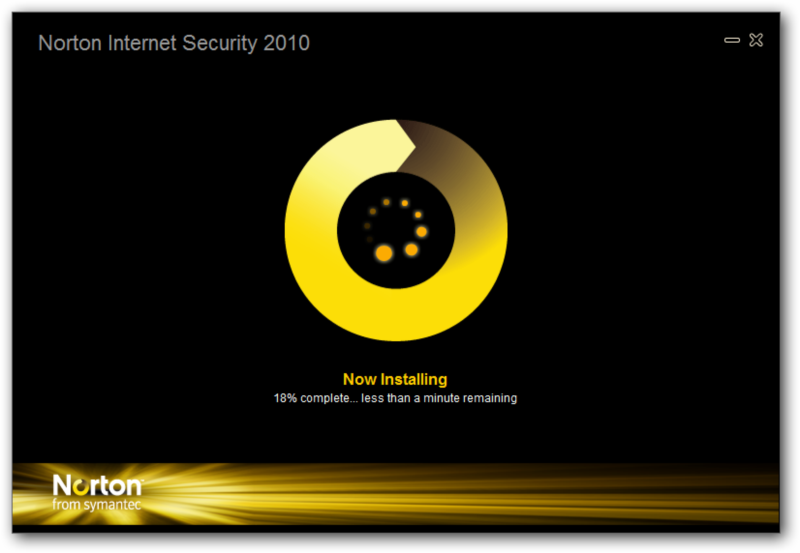 Upon installation of NIS 2010, Norton Safe Web toolbar is installed in Internet Explorer and Mozilla Firefox automatically. Since the toolbar get installed, I did some testing by accessing some poor rating websites. And what surprises me is that Norton Safe Web tells me that the website I am accessing is rated safe, while my Web Of Trust plugin in Firefox warned me about the poor rating of the website. I am not sure how the Norton safe web works, but apparently it doesn’t rate a website following community rating. I found this can be easily misleading, especially to those who new to internet/computer, as most likely they will trust on the AV software, rather than judge by themselves. It runs pretty well and smooth by the time of writing, although I can’t say much since it has been installed not more than a day. But so far so good. A Quick Scan only take less than 2 minutes, with around 6,000 files scanned. I haven’t fully executed Full Scan, as it does cause some lagging here and there during the scanning, but I expect it can be done within 1-2 hours (of course depends on the number of files and the volume size). Under normal condition, NIS 2010 only used 3% of my CPU, just nice. I am glad that I had tested this latest Norton product, as I am totally impressed with the improvements over the previous products. Although it has a questionable Norton Safe Web feature, but all in all, a very complete internet suite for everyone, easy to use, simple interface, highly customizable, nice gadget on the desktop, and the most important one in my opinion: killing short-installation-time. I’d say it has the potential to win over other AV companies. If you are interested to give it a try, you can always download the 30-days trial version of NIS 2010 from here.